On Saturday evening, we had our good friends over for a little cookout. Brad is the manly grill master so he was in charge of the meat. That left me with the side dishes and dessert. I made a delicious strawberry pie. Seriously, it’s so good I had some for breakfast the next day– hey, it’s fruit. And we roasted marshmallows over our fire pit and made s’mores. I also tried out my mom’s broccoli salad recipe. Our friends really liked it so I thought I’d share with you guys. When I was younger, I didn’t care for this broccoli salad. But I also didn’t like these either, which I love now. Oh, childhood palates. Now I’m an adult with a sincere appreciation for vegetables dishes, especially those that contain bacon. The key with this recipe is to make the dressing in a separate container and add the dressing a little at a time. I don’t like my salads drenched in dressing so I add some dressing, stir it, and take a bite. If needed, I’ll add more dressing. Because you can’t really remove the dressing once it’s in the salad. I’ll let you know that the dressing is on the sweeter side. But it works out well with the taste of the broccoli, bacon, onions, and raisins. And speaking of the sweetness of the dressing, when making it, make sure you give the sugar time to dissolve. You don’t want a gritty dressing. When making this broccoli salad, you can kind of do what you want with the main ingredients. If you LOVE bacon, you can use double the amount. If you hate onions, you don’t have to use them, or you can substitute with water chestnuts so you get the crunch but not the onion flavor. If you prefer your vegetables swimming in dressing, use all the dressing or double the dressing recipe. This is the nice thing about cooking (although you only cook the bacon with this recipe) rather than baking, you don’t have to be precise and can play around a bit. Click the image of the recipe card to download and print it. What foods did you dislike as a kid that you enjoy now? My grandmother makes almost that exact same broccoli salad (she add sunflower seeds)! I LOVE it! I had this salad Saturday at a citizenship party and always forget how much I love it. I was saying how I have to get the recipe and make it myself, and here you are with a post!!! Thank you so much for fulfilling my desire lol. I read your mind, Dawn! Yum, I love broccoli salad! This looks awesome. Bacon makes everything better. EEEEEeeeeverything. 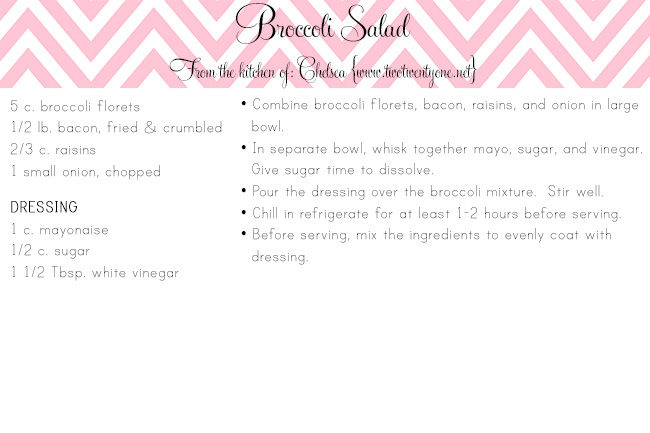 Broccoli salad is one of my favorites! It’s absolutely delicious! That broccoli salad looks delicious–I’m definitely going to try it! Our dog is terrified of fireworks too…we just got him a thundershirt, and it seems to help a little. Does the benadryl help Jack? I never thought of trying that. The Benadryl helps take the edge off a little. Our vet said it’s okay to use during storms and fireworks to make him more sleepy. I can’t say it’s 100% effective, but it seems to help a little. Some people have recommended sprays but we haven’t tried those yet. With our little guy, Snickers, the Thundershirt is an absolute necessity but not a complete fix. Unfortunately he does not like to be held during storms – I think he wants to be able to make a fast exit, if necessary. We got him an indoor soft-sided dog house from Homegoods and put it in the corner next to the sofa. That seems to put him much more at ease when we have thunder and lightning. But when the fireworks come, he makes a beeline for a room with no windows and his “storm shelter”. In this case it’s just a dog bed – but my Mom discovered that if you put a towel over him, he would eventually calm down and fall asleep. He does look like one of the the Three Wise Men though! We always make this with sunflower seeds and golden raisins. Great summer dish!!!! If I leave out the bacon (I don’t eat bacon), I assume it would still be yummy, right? I love broccoli salad. Sometimes I substitute craisins for the raisins and add cut up red seedless grapes. Also, use Red Wine Vinegar instead of the plain vinegar. Also like it with a little bit of toasted sliced almonds added. Has anyone ever tried to make the dressing with splenda instead of sugar? 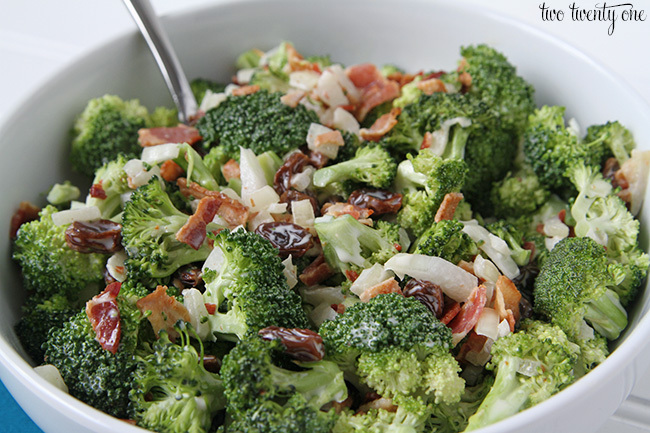 Thanks for the broccoli-bacon salad recipe, I love it and it’s relatively healthy too! A few foods I disliked as a child were spaghetti, liver, and shredded wheat cereal, but now I love spaghetti. I remember loving to eat sardines right out of the can with my dad as a toddler, which is completely disqusting to me now. I would like for you to be able to send me the recipe. I love the salad, but I am unable to do much because I have pancreatic Cancer. I. can’t even get out to put jars to have a collection taken up to help me with medication and bañdages for my stomach that has a tube commingout of it.Thank you . I have never heard of broccoli salad before! Family cookouts are right around the corner so I think I’ll have to give this a try! There are always ladies at church who make a salad similar to this and I have always wanted to try it myself. Thanks for sharing! 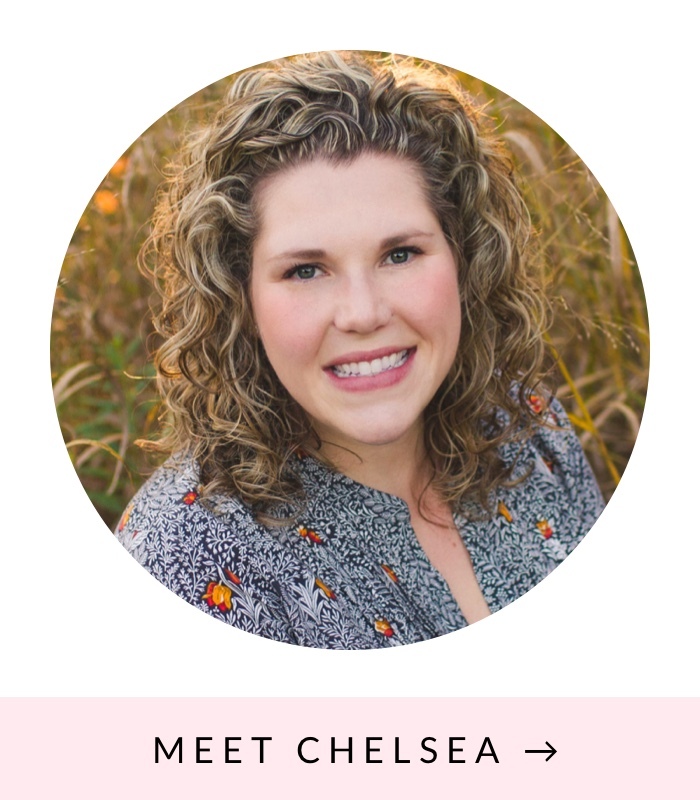 Thanks for linking up with Delicious Dishes Link Party! Thanks, Jeanne! It definitely is! 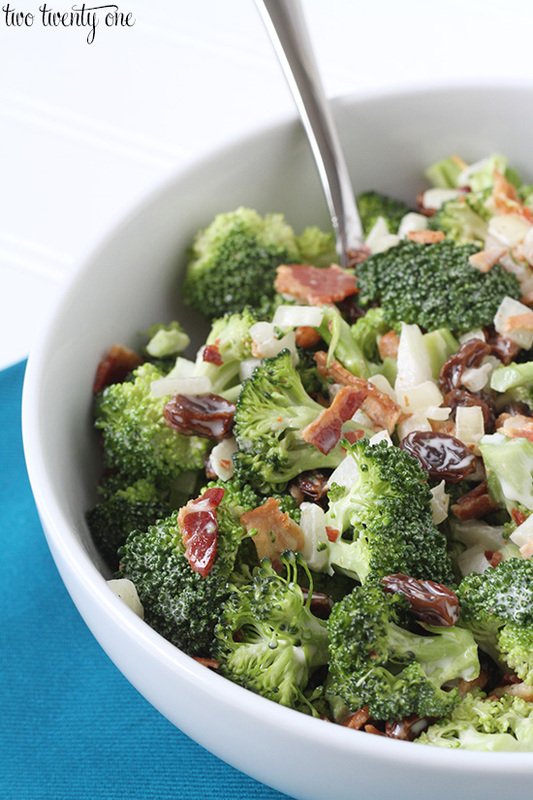 This broccoli salad looks ahhh-mazing! I’m a big broccoli lover and so isn’t my family. I’m saving this for later! Thanks for joining us this week at the Wake Up Wednesday link party! 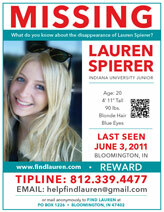 Hope to see you again next week! That looks so yummy! I need to add this one to my recipes! Thanks for sharing at Wake Up Wednesday link party! I love broccoli salad! It’s probably one of my favorite dishes. Thank you for sharing at Merry Monday! Looks like a great salad to make for barbecues! Thank you for sharing with Delicious Dishes Recipe Party this week! Hope to see you again for another party tomorrow!